As outgoing Secretary of the Board, I want to share a few notes from our annual meeting and a few observations of the work ahead of us. In our recent board election, we had 138 members vote out of the 397 paid members. While this is actually a significant number of voters in comparison to past years, I want to encourage our members to take a more active role in our organization, not only in voting for your national representation, but in taking on leadership roles in your regional focos. Please remember to keep your membership updated annually and encourage others to become members of our organization. Your membership dues sustain our operations as an organization, while your registration at our annual conference is what pays for the conference itself. This year, in the days leading up to the conference, we had 200 pre-registered attendees, but 400 people listed as presenters on the program. The earlier you register, the more accurate our account can be as we prepare for the conference. Further, it is vital that presenters and all attendees pay their membership and conference registration. So many of us have benefited over the years professionally and personally from NACCS. For many of us, it is where we first presented at a national academic conference. 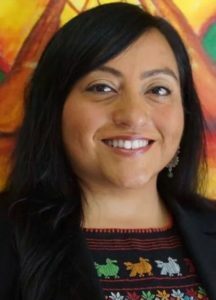 It has given us a platform to share our research and engage in important discussions about our field; it has provided a space to bring together scholars, activists, and community in order to advocate for all that we value in Chicana/o Studies. It has been a space to cultivate the next generation of Chicana/o Studies scholars. Therefore, it is critical that we invest in NACCS through our membership fees, conference registration, website and program advertisement purchases, and donations. As we approach the 50th anniversary of the Third World Liberation Front and the birth of the Plan de Santa Barbara, it is important to reflect on the next 50 years of our discipline and how we can continue to grow NACCS. As a board, we discussed the need to restructure the way we pay for membership and registration online. The current invoice structure is extremely labor intensive and will be retired. The board will work on developing a more streamlined way of handling payments in the future, with clear instructions for our members. We are exploring how to make our website more accessible and how to add links to pay caucus dues and give donations. I am excited about our National board leadership and look forward to the work they will continue to produce for our organization. I look forward to supporting the incoming secretary, Lilia Soto and have confidence in all the new incoming leadership on board that they will continue to good work of NACCS. Lastly, I want to publicly thank and express my admiration for the Executive Director, Associate Director and the entire board for your leadership, collegiality, and perseverance. I have learned and gained so much over the past 2 years as secretary and encourage others to consider service to NACCS in the future.